Pohe are a very popular Maharashtrian breakfast or teatime snack. 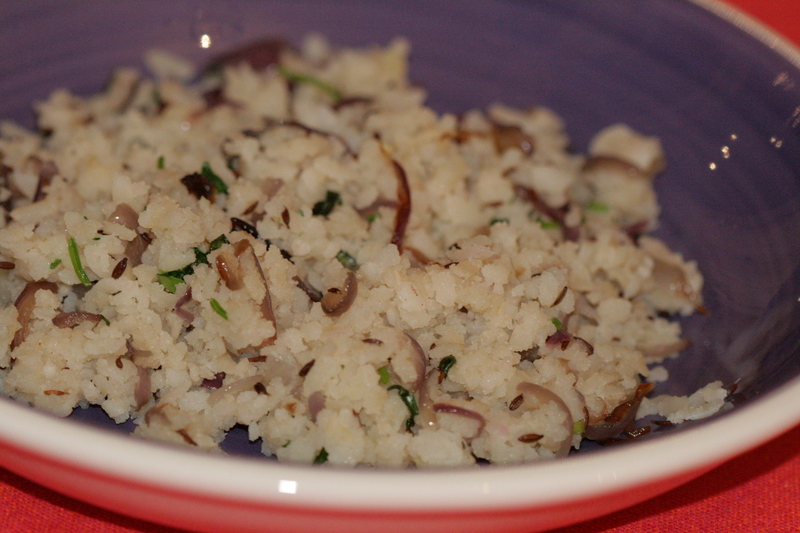 If you prefer to eat a light meal first thing in the morning, this super quick dish is just right for you. You can always spice it up or down depending on your taste. Time: 10-15 minutes (Chopping the onions is probably the only time consuming part here! Heat the oil in a large shallow pan. When the oil is hot, throw in the cumin seeds. When they splutter, add the chilli and the curry leaves. Add the onions and cook till light pink or brown on a medium flame. Once the onions are cooked, add in the pohe and mix well. Season with salt, add the sugar, chopped coriander and a squeeze of lime. If you prefer a spicier version, add 2 small chillies at stage 1. If you prefer the regular yellow pohe (also known as Kaande Pohe), add 1 teaspoon turmeric and 1 teaspoon red chilli powder during stage 2. This entry was posted in Teatime snacks or Brunch ideas and tagged avalakki, beaten rice, brunch, coriander, kaande pohe, Maharashtrian breakfast, pohe. Bookmark the permalink.